If any place embodied the “moonlight and magnolias” mythology of the Old South, it was Natchez, Mississippi. 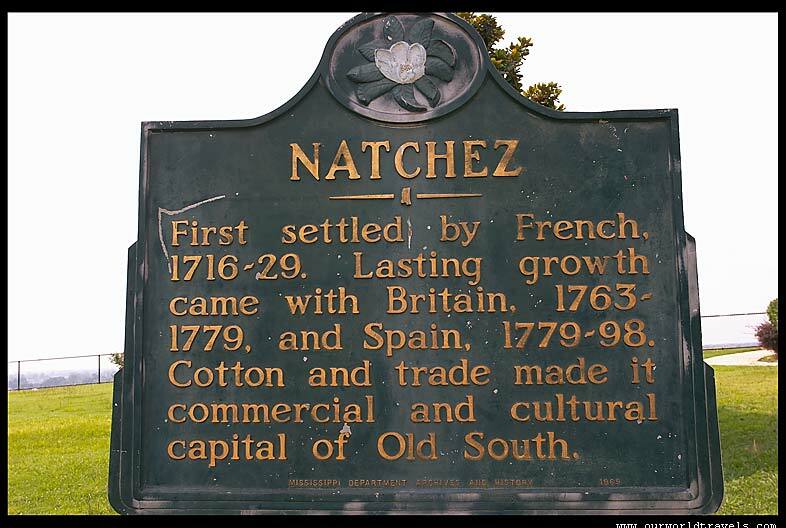 Perched on a bluff over looking the Mississippi River, Natchez’s small size (only 4, 680 inhabitants in 1850) belied its economic importance, In 1838 Natchez-area growers sent forty thousand bales of cotton doenriver to New Orleans. Moreover, the city’s forty most prominent families, referred to as the “nabobs” included the largest and wealthiest cotton planters in the entire South and some of the biggest slave owners in the world. This begins a series of posts about our two days in Natchez, Mississippi , a place we visited with mixed feelings. Having visited Dachau, the concentration camp near Munich and the old slave forts in Ghana where slaves were held before boarding the Portuguese slave ships , we have experienced the heaviness of spirit that still remains in these places of great suffering. Natchez was the same, but it is a part of our history and should not be denied. We both wanted to see the antebellum plantations and decided to go. We stayed in this beautiful Monmouth Historic Inn. Our two nights were in celebration of big milestone birthdays and anniversary and the experience was most memorable. This entry was posted in Architecture, Travel, Uncategorized, USA and tagged Monmouth Historic Inn, Natchez Mississippi, Old South, plantations, slaves, Where Cotton Is King. Bookmark the permalink.